Kharazim Kharazim is a joke. I have never lost to a Kharazim with any build with Artanis. His self-heals cannot sustain him. His extra crit's get nullified by shields, and his mana conservation is garbage. Easy target. Zeratul Zeratul's cleave and bomb combo will put you at 50-60% health. Triggering your shield, and id you go this damage build, he shouldn't be dangerous. Tyrande Her mark and stun is about it. Her AA's are not a problem. If she stuns you in Mid Blade Dash you could be dead. Sonya Artanis lack of cc makes it very hard to 1v1 her. If you can predict her other abilities and dodge it with Blade Dash you can win. Just takes more micro-managaing. The Butcher He if marks you it is game over son. If you go a tank build you can survive, but you can't kill him. By the way I killed Sonya, Muradin, and Diablo by myself. Hey I am Berzerk. I love the Warrior Role and that's my specialty. I play every other class as well, but Warrior is just the most enjoyable. My Battle.net tag is actually #SacredEch0 for those who don't know, anyways I am hear to tell you a build I found out after playing Artanis for a while, as he has become for favorite hero because of how balanced he is. Here is the competitive breakdown of Artanis. Artanis is the leader of the Daelaam. A renowned warrior, he seeks to unify his beleaguered people, and will let nothing stand in his way to restore the glory of the protoss. As a member of the Templar Caste, Artanis served extensively alongside his comrade Fenix. The two traveled across hundreds of worlds. The Blade Dash is amazing, I usually like to use Blade Dash after I just Twin Blades someone; aim for all enemies in the pile to maximize damage, and slightly bring your health down, so surprise shields trigger. You should use it at least twice in a team fight. I save the 2nd Blade Dash for the killing blow as they the enemies are running away. For this build we are not going the talent Zealot Charge, so we can't catch up that way, anyways you get the killing blow and get to return to safety. A lot of times if you keep using your Blade Dash you have done damage, but miss the killing blow, which is a bummer. You try to suffice that tragic situation with the talent Templar's Zeal. Level 7 You get Follow Through which basically makes your Twin Blades have 3 powerful strikes. Not to mention the extra damage you have from Seasoned Marksman from Level 1. Then at Level 13 you get Triple Strike which adds a real 3rd strike on Twin Blades. You now have 4 BURST damage auto attacks that roughly do 200 damage a hit later in the game. Giving you a whopping 1000 damage. Level 16 is when you get Titan Killer and face their tanks or high health Heroes, such as Johanna or Leoric. Overall that increases your damage greatly. Then Level 20 just tops it all off with Nexus Blades, by increasing your burst damage and slowing them so you can catch up and repeat the process. Side Note: You can kill Lt. Morales with one combo at Level 20. Phase Prism is honestly one of the hardest skill-shots to land in the game, due to it lackluster of speed and range. When you see an Artanis coming he is very predictable, much like Arthas is with his roots. If you do get in position and get the opportunity to land this ability, then a whole new world shines for you. You can body block and land your Blades of Glory combo, and set your teammates up to destroy the enemy. You can also take someone out of position like Sgt. Hammer from her hiding spot; or take a charging Illidan or Kharazim and send them into the middle between the frontline and backline and get melted and zoned away from the team. My favorite is early game defense on pushing and you land the Phase Prism and get the enemy slowed by your fort/keep, forcing an early game kill. Overall great ability, just very difficult to land. Shield Overload is the crux of Artanis You want to utilize this, just like you would use Chen. Chen has a talent called Brewmaster's Balance which allows him if around 50% health do more stuff. It's the same thing, but this is your trait. I would prefer Lt. Morales or Li Li to be your healer, so it's not to much of a heal, but enough to keep your shields going. Use this to your advantage, but don't get caught out because you think you are invincible. Retreat if your shield is being bursted down, because the cooldown is fairly long. Keep on going in and out of combat, until the opportunity open itself, for example if the enemy team, have used their Heroic Abilities, than going all in is a good idea. Supression Pulse is very self-explanatory. The Heroic is generally good for teams who have auto attack builds. It is basically a silence, but for heroes such as Raynor, Illidan, Valla, The Butcher, etc. It has unlimited range, so if you die and resurrect and your teams need to get away, or get that final kill and you are not there, than you an use it. It comes in handy. IMHO this one is better choice as Heroic ability. It's nice increase of damage. Well timed and placed Q when targeted can completely nullify an enemy hero from the team fight or get melted in a 1v1. Usually forces a retreat. All around very helpful, although it can be easily dodged, you just have to target it correctly and at the right time. Seasoned Marksman - I love this talent. You are a bully in the lane usually with everyone. Killing minions are not a problem. You need this if you want to deal out the major extra damage. In a decent game you gain around an average of 25 stacks if you lane correctly, before the team fights occur, and wreak havoc on your opponents. For this build this is a must, it just isn't worth going this talent on the maps that end early. That's mainly Haunted Mines, overall this is a great talent to choose and my favorite for Artanis. Reactive Parry - I think this talent is great for when you are going against auto attack or DPS heavy teams, such as Raynor, Valla, The Butcher, Sgt. Hammer, etc. Makes Shield Overload so much more viable. You really wont be able to avoid the first hits, but it makes engagement easier and leaves time for your trait to trigger, and for you to unleash hell. Khaydarian Resonance - The description of the talent in theory sounds great, but to be honest it is not that great. The Phase Prism ability is awfully slow, and the range is very short, which makes you miss the ability a lot. When you miss of course the cooldown drops and the mana comes back, and you will have another shot. Well if the skill shot is hard to land... the second try will still be hard to land. Basically the Phase Prism is not the crux of Artanis. Reactive Parry and Seasoned Marksman flatters Artanis way more. Amateur Opponent - Good for waveclear and pushing. This is an iffy talent for me to pick, because he doesn't have the fastest auto-attack speed, and I rather leave the wave clear to someone else on the team, like Jaina. You're just sacrificing Seasoned Marksman which involves killing minions as well, which isn't really worth it. Works on Blackheart's Bay chests for quick coin gathering that's a positive. Helps for taking out camps as well. Templar's Zeal - This is the overall best pick. You always want to have health around their, and even if you don't want your health down to 50% it's going to anyways. This talent reminds me of Brewmaster's Balance and how the 50% increments works. Anyways as I was saying... because you are going to be down and your Blade Dash will be recharging 75% faster. You increase your chance of getting the kill, more dodging openings, and the talent just overall opens up new opportunities for you. Shield Battery - If you want to try and go of a more tanky build you can use this I guess. I would only pick this, If I knew that I wasn't going to be targeted. For example, if their was a Jaina, Lt. Morales, or Kael'thas that needed to be taken care of first I would maybe take this. That's a strong maybe. Usually your shield will be gone before hand, especially if you are going into a fight balls deep. You would probbaly have to play more conservatively with this talent, and that's not my ideal perspective of playing Artanis. Lethal Alacrity - This range and speed increase isn't really worth it, you can have fun using it and it might give you that clutch last hit into getting a kill, but long term it will be outgrown and soon become obsolete. It is not worth the sacrifice of multiple Blade Dash uses or shield regeneration. Chrono Surge - This is one of those talents that sounds great and over powered in theory, but hear is how you have to view it. When you land the Phase Prism you are going to be some distance away from the enemy perhaps wasting 2 seconds before you get some hits. Another factor is that Phase Prism is hard to land. I will keep on saying that, the ability is very slow, predictable. and can be easily avoided. Not worth not picking Shield Battery and especially Templar's Zeal!. Follow Through - This is easily my favorite talent for level 7. I picked this almost every time I played as Artanis. It makes you get a 3rd hit on your W. Later on you can get a real 3rd strike on your W, but with Follow Through you get a 4th hit. All 4 hits melt the enemies health. Extra damage from Seasoned Marksman is overkill. Warp Sickness - I usually would say crowd control would be the best pick, but this time it's not. Once again the ability itself it hard to land. If you are very good at landing it than this talent can be viable. It basically is a point of no return for the enemy, especially if it's a long range Phase Prism, I would maybe go this talent if I was facing for example, Li Li, Zeratul, Anub'arak, Muradin, Tassadar because they have a good source of retreat that can be nullified. This is a great talent, and I wouldn't pass this up if you can land his E well. Solarite Reaper - The increase of 150% damage is something that looks good, but actually isn't worth it. Artanis is a DPS character not a burst damage character. Yeah you might have extra damage that would kill off an opponent, or maybe more wave clear, but leave that to someone else, that is not your role on the team. Psionic Synergy - This can correlate extremely well with Templar's Zeal. This can allow you to dish out more damage AoE style if you choose to. Very well, if you want to antagonize the backline of the enemy team. You sacrifice more burst damage with your Twin Blades for more AoE damage. I guess it's situational. Both can be a game changer. Suppression Pulse - This is a great Heroic Ability. The fact that it has unlimited range, means that you can save someone's life essentially. If you are not at a team fight, for example if the enemy team forced a fight, or even tried ganking a team mate. You can use this and save them. Especially against DPS heavy teams. Purifier Beam - This is my personal favorite, because it can take someone out the fight completely. Many people say this talent is bad, because it can be easily avoided, but they are missing the bigger picture. It has more utility than damage. 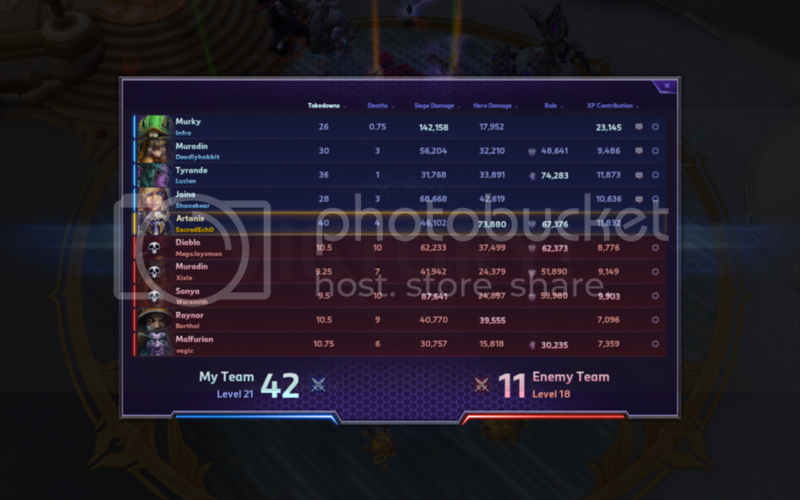 If you can take someone out the team fight completely like Lt. Morales for sure, or a Nova, Zeratul, and Jaina. You have won the fight. Now if your team takes advantage of this ability, and roots or stuns the enemy in place, than it is a guaranteed kill, but just the fact that it takes an enemy out the fight is enough for me to pick it; and to be the 1v1 master! If you trigger this ability during a heated 1v1. You have a for sure kill. Unlimited range, allows you to cast it at opportune times when you are not at the team fight, and the damage could be the winning factor in your game. Triple Strike - This is the crux of this 1v1 build. The barrage of attacks that you unleash at your opponent is so sudden and quick. Having 4 strong basic attacks take deals 1000+ is amazing. Phase Bulwark - This is basic. It's a talent that blocks ability damage like Grounding Brew and Spell Shield Take this if you are going against heavy ability/burst damage teams and you are being destroyed. Great talent. Graviton Vortex - Very pointless to me. Great on paper, not in game. You usually never grab two enemies because they are not right next to each other. If you are in a team fight, and you can grab two that fine and dandy, but that leaves you in a very bad position yourself, so you are taking a gamble, if you are putting your bets on pulling two people. that also puts two people behind you, which can basically kill you. Not worth it to me at all. Burning Rage - This is never really a bad talent to go. It is very basic. I would go this talent because of Blade Dash. Artanis doesn't sit in one spot, like Johanna or Chen, so the AoE effect can't really do anything worthwhile. The extra strike and and resistance to ability damage is higher on my list any day for my boy Artanis. Titan Killer - This is Giant Killer x2. Why not get a talent that is doubled. This is amazing and just adds on your diversity in the heroes that Artanis can destroy by himself. For example, Leoric, Muradin, E.T.C., and Johanna are very beefy characters. With this talent you can melt their health down as if they were assassins. Very good talent. I would pick it most of the time. Crux to this build, not so much Artanis though. Psionic Wound - This is a great talent... only if your team can utilize it well. Johanna has a similar talent to this one. It is called Sins Exposed. Not the exact same, but you catch my drift. When you land your W and your team bursts all cool downs on that one person, then adios. If no one targets the person you triggered it with. The talent is generally pointless. Maybe good in team league, but as far as Hero League and Quick Match, I would give the best bet to Titan Killer. Zealot Charge - This talent leaves you in front on the target at all times, and can be very scary. I sometimes go this talent, if I need to chase enemies like Li Li, anyone who has a good retreat. Not the most ideal talent, but can get he job done. this talent is very situational, but not bad at the very least. Shield Surge - Excellent talent pick for a tanky build, or if you are just simply being bursted down. Same as Zealot Charge, not a bad talent, and is very situational. Nexus Blades - This makes your damage go off the roots. Makes you not a bruiser, but a ****ing POWERHOUSE. Excuse my french, but it is very powerful and synergies with Artanis better than most heroes in the game. You basically become a glass cannon tank... how about that!